Blair thinks Labour should be opposing Brexit. 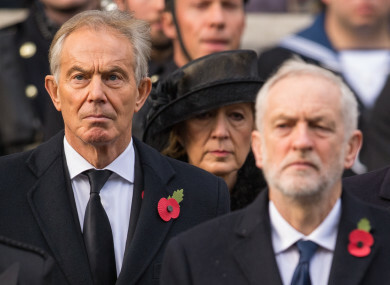 Blair and Corbyn and a Remembrance Day event last year. TONY BLAIR HAS launched a fresh attack on the direction of the Labour Party he used to lead, saying he disagrees with its Brexit position both “strategically” and “tactically”. The former three-term UK Prime Minister used the website of his think tank to say that Jeremy Corbyn’s Labour would be “the handmaiden of Brexit” if it continued along its current path. Blair feels that the UK people should be able to vote again on Brexit after the final deal is agreed with the EU. Blair said today that Labour should be actively challenging Brexit rather than its current position of opposing the Brexit plans as laid out by UK Prime Minister Theresa May. The Labour Party are not in favour of a second referendum, unlike the Liberal Democrats which are pushing for a rerun vote. May’s government is negotiating exit plans and the outlines of a new trade relationship with the EU with an eye toward departing the bloc by a March 2019 deadline. Blair and other opponents argue that voters should be able to review these terms and decide whether to go ahead rather than be bound by the 2016 referendum. “I’m simply saying one very, very simple thing, which is that in 2016 you knew you wanted to get out of the European Union but you didn’t see the terms of the alternative relationship,” Blair later told the BBC Radio. Current Labour leader Jeremy Corbyn was criticised by many Remainers, both inside his party and out, for not campaigning strongly enough in favour of Britain’s continued membership of the EU. Some commentators have argued, however, that Corbyn’s perceived suspicion of the EU helped Labour win support from some Brexit-leaning voters in last year’s general election. Although Corbyn’s party did not win last year’s election, he increased Labour’s vote share by the biggest margin for 70 years. But Blair, who has long been skeptical of Corbyn’s leadership, insists that Labour should be doing more to fight Brexit. “I would like the Labour Party to be on the high ground of progressive politics, explaining why membership of the European Union is right as a matter of principle, for profound political as well as economic reasons,” Blair wrote. Entitlement to "think again" on Brexit. Blair argues that the focus of May’s government is on Brexit and that, by not opposing it, Labour are hamstrung in how they can attack her government’s policies. “Make Brexit the Tory Brexit. Make them own it 100%. Show people why Brexit isn’t and never was the answer,” he adds. Blair’s popularity in the UK was hit following his decision to take the country into the 2003 Iraq War and due to the arguments he made in its favour. Since Brexit he has been more vocal on domestic politics but has not formally reentered the political arena. Email “Tony Blair has had a huge go at Jeremy Corbyn's position on Brexit”. Feedback on “Tony Blair has had a huge go at Jeremy Corbyn's position on Brexit”.